Encourage Developers follow the sustainable standards outlined in the: City of Chicago :: Chicago Sustainable Development Policy Handbook beyond the minimum required. Create Commercial Development Guidelines integrating previous sustainable community research consistent with chosen reference standards for the project. Replace large open parking lots with compact, multi-level parking integrated into mix-use structures fronted by commercial active spaces. Encourage commercial infill & building repurposing/restoration, so that local businesses & shopping is available to all. Create better east/west access to our lakefront and lakefront path. Add reasonable and paced green and energy efficiency features, water management and renewable energy elements into new developments as well as retrofit of current buildings. Coordinate with CTA, I-GO, ATA and public officials energy efficient and effective transportation options, including safe bicycle and pedestrian path options. The main building facing Ashland will be repurposed with 200 residential units and no retail. Building remediation is over and work is proceeding in 2019. 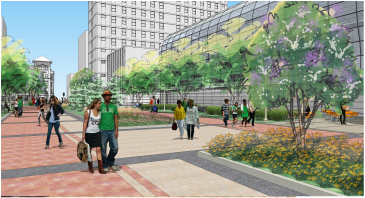 Plans include a park behind the main building which will be maintained by Chicago Park District. The final design has been approved by CPD and the community. CTA Renovation Plans 2019 & Beyond - Input was developed & submitted to include Sustainable Design as part of basic Plan Red Line renovations have begun.